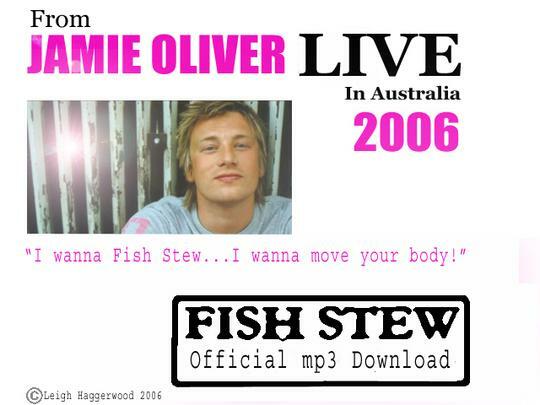 From Jamie Oliver's spectacular Australian live show, the official FISH STEW download is here. Jamie Oliver sings this recipe for fish stew whilst cooking it on stage. With a great melody and words that will have you cooking it yourself in no time. Now available to download for a limited time! Listen to the preview, download the full 4 minute song here or at iTunes for just 0.99 Cents! Copyright Haggerwood / Big Fat Audio 2006. Just a glass of wine will do just fine and the rest of the bottle for me. Just a few more herbs to sprinkle on top and a couple more minutes and we're ready to rock! And now you've shown me how, I want a FISH STEW. This song is the copyright property of Leigh Haggerwood / Big Fat Audio and may not be re-sold or offered for free download elsewhere. Genius - How did this past the censors ;o) ??? ?